Recorded it and am watching now. I thought it was entertaining. Some pretty funny parts. I'll keep watching. Is this a 30 or 60 minute comedy? I believe it will normally be 30 minutes but last night was considered two episodes. This is either wrong, or the show is different than I thought. Shouldnt Forte be in all the episodes? Hmmm...you would think so. Maybe next episode will start and it'll say he died and it'll never show him again. The margarita pool was hilarious! awright wrote: The margarita pool was hilarious! As was his explanation of how to use it. There's no wrong way to use a margarita pool. Is he talking to the camera or just himself? Himself. Also balls that he put faces on. Like tom hanks. wags83 wrote: Himself. Also balls that he put faces on. Like tom hanks. "Oh, and I just got to say, huge apology to Tom Hanks and the whole crew that put together castaway. Cause they nailed it. They friggin' nailed it." You all report back after next week's episode and then maybe I will check it out. Tyler wrote: You all report back after next week's episode and then maybe I will check it out. 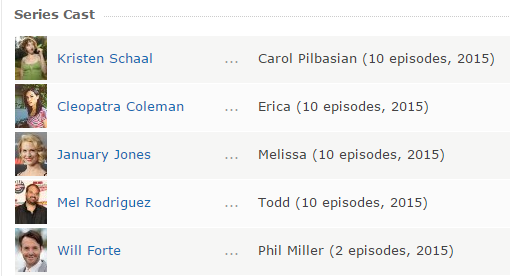 The main character's name is Phil Miller, a combination of Phil Lord and Chris Miller...the directors. You know, the guys responsible for The Lego Movie. Say no more.